THE Source For Sports Collectibles! Holds 24, 12oz. cans. 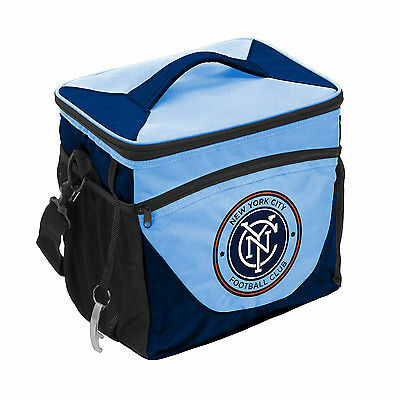 Emroidered logo on front, carry strap included.Officially licensed by the NYC FC and the MLS. Your Price: On Sale Now … See Price Above! Shipping: Domestic Ground Shipping is FREE and arrives in 5-7 business days. We ship all orders by USPS or UPS, depending on the size and weight of your total order. All orders include tracking and/or delivery confirmation. Order as many more items as you like for no additional shipping charge! Availability: In Stock Now. Usually Ships in 3-4 Business Days! Why Buy From Champions On Display? eBay is our business, not a hobby! We take selling on eBay seriously and our goal is to be the best. We think our feedback proves it! We guarantee your satisfaction! If for any reason you are not happy, just let us know. We'll refund or replace your order … no questions asked. We guarantee your item is in stock and shipping! If for any reason your order is not available, we'll promptly refund your money. We offer the best Customer Service on eBay! All e-mails are answered promptly and your satisfaction is 100% guaranteed. Our feedback speaks for itself! More ways to pay! In addition to PayPal we accept all Major Credit Cards! Our order fulfillment and shipping time is among the fastest on eBay and head and shoulders above our competition. You'll get your item quickly and safely! We offer great shipping rates and every order comes with detailed tracking or delivery confirmation. Thank you for choosing Champions On Display! Check-Out Now! If you are the winner of an auction, or you have made a Buy It Now purchase, you may check out immediately through eBay's secure checkout and pay by PayPal or any major credit card. Check-Out Later If you do not choose to Check-Out now, you will receive an email with a checkout link or you may visit your My eBay page to check out at your convenience. Please be sure to make payment within seven (7) days of your purchase. You may also purchase additional items from Champions On Display. Make sure all of your auctions have ended prior to checking out. All of your purchases will be consolidated into one checkout and a combined invoice will be sent to your e-mail address! PayPal and credit cards are the preferred payment methods. Pay with PayPal or by credit card for quickest delivery. Sorry, we don't accept personal checks, but you can use an eCheck if paying through PayPal. Payment must be received within seven (7) days of the close of auction. If payment is not received within 7 days, the auction will be canceled and a "non-paying bidder" claim will be filed with eBay. This filing is required by eBay to recover Champions On Display’s fees incurred by the sale of the merchandise on eBay. Buyer may choose to reimburse these fees to Champions On Display in lieu of the non-paying bidder claim being filed. eBay does not allow sellers to “cancel” a sale (this is for the buyer’s protection). Purchases made “accidentally” or by someone else using the buyer’s eBay account are the responsibility of the buyer. For shipments to Oklahoma addresses, we are required by State law to collect 8.00% Sales Tax. We ship PROMPTLY … just check our feedback! Most items ship within 24 hours of payment (excluding weekends and holidays) and because our central U.S. location, most orders arrive in 2-4 days! All orders are shipped via UPS or USPS. You will receive an e-mail with a delivery confirmation or tracking number when your order is shipped. We pack items professionally and securely! See item description above for Availability and the Shipping Chart for shipping costs and options. Feel free to contact us with your questions by using the "Ask A Question" link at the bottom of this listing. We strive to answer all e-mails within 24 hours of receipt during the business week. If you need to contact us by phone, you may do so toll free at 1-866-581-8770 between the hours of 9:00 AM and 5:00 PM CST, Monday through Friday. Our AUTOMATED Feedback system leaves positive feedback for buyers IMMEDIATELY on payment! If you are happy with your transaction, please leave us Positive Feedback. If for any reason you do not wish to leave Positive Feedback, please let us know and we will work with you to resolve problems, so that we can both benefit and improve each other's feedback ratings. Help eBay build a better community through responsible feedback! Your satisfaction is guaranteed! If for any reason you are not satisfied, just let us know within 60 days and return your purchase for a refund. Merchandise received by the customer that is damaged, faulty, or incorrectly advertised will be refunded at 100% of purchase price. Refunds for other reasons may be subject to a 20% restocking fee. Refunds do not include shipping upgrades. Merchandise must be returned in original packaging and undamaged. We require a Return Authorization for every return.Please email us by using the "Ask A Question" link at the bottom of this listing, or phone our toll free number at 1-866-581-8770 to request a Return Authorization. Returns should be sent to Champions On Display, 223 E. Main St,. Norman, Ok, 73069. Our customer service representatives are always available by e-mail or phone to help correct any problems you may have with your order. Just contact us by using the "Ask A Question" link at the bottom of this listing or toll-free at 1-866-581-8770.